Dimples...isn't that one of those facial features that everyone wishes they had? Dimples are always a sign of innocence and beauty. A feature, whose goal is to cause envy. Envy of a smile that is so stunningly cute that it was poked at the end, like an exclamation point of a sentence. As with dimples, there are many other things about other people, and the way they live their lives that I envy and am jealous about. One of those things is, and it seems so simple, is belonging to a book club. I, for the longest time, had heard people talk about book clubs and the tons of books that they are able to read, and share with others. I had a friend in college, who was an ARMY wive, that belonged to the "ARMY Wives Book Club". Everywhere I turned, book club, book club! Oprah's book club, Barnes and Nobles book club. U-G-H!! 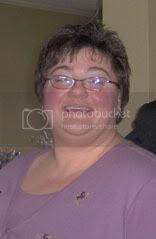 Until January 2008, when my best friend Annmarie and I had had it! We were going to start our own book club. Our very first book was "Kite Runner". That book ended up being one of my all time favorite books. We try to get through a book a month, sometimes it takes us a month and a half. We are currently reading "The Hours", and I have no complaints so far! It's so great to share a love for books with someone, be able to sit down, over a cup of coffee and talk about what we as individuals are taking from the book. We have decided to keep our book club at a two person limit. Not that we don't want to share our club with anyone else, but as two young adults we feel that the start of our book club is something sacred. Something that the two of us can share in, hoping that others look at us the way I look at dimples. While immersed in my September book, I couldn't help but also be introduced to the perfect book reading cake! 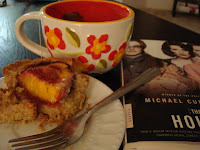 Dorie's Dimply Plum Cake (except made with Peaches) was the perfect compliment to my cup of Chai Tea and an hour on the couch with the women of "The Hours". Michelle of Bake-En couldn't have picked a better recipe for me. As mentioned earlier, I traded plums for peaches. 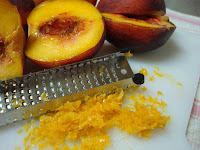 I am a die hard peach fan and decided that grapefruit zest might make an interesting accent flavor. Sprinkle in a little cinnamon and you've got one heck of a cake. The peaches were so sweet, but were hit with a little grapefruit punch right at the end. 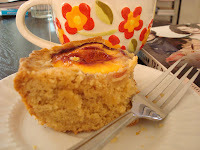 And the cake is so buttery and light that I had to force myself to stay away from the pan. Here's to everyone whose every turned envy into passion and love! Lovely cake! And good for you starting your own book club. My friends and I tried one but we never finished the book and just ate and talked! :) I hope you like The Hours. Still looking for my book club here so I know what you mean! Your cake looks really wonderful! I too think of book club, but I have to yet find the time (or the club!). 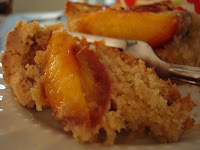 Your peach cake looks awesome! 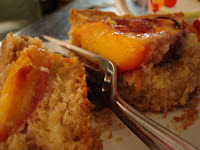 I really should've trusted my instincts and gone with peaches, as you did. But what an interesting idea, going with grapefruit zest! That was inspired. Now that I think of it, this really is a perfect cake to go with a book. Great idea with the grapefruit as well. I love the little illustrated story, feels like I was right there having a cup 'o joe, talking about facial dimples! Peaches, grapefruit zest, cinnamon -- sounds delicious!